by W.Bro. Yasha Beresiner, [see short biographical note after lecture], Past Master (1997/8), Quatuor Coronati Lodge No 2076 (Premier Lodge of Masonic Research) (Reproduced by kind permission of W.Bro. Beresiner). The eventful life of Arthur, Duke of Wellington was evenly apportioned between a triumphant military career and a hardly less remarkable political one. His early involvement in both fields kept him away from home, which may explain why, notwithstanding his five-year membership of the Lodge in Trim, he never progressed beyond the first degree of Freemasonry. Arthur Wesley, whose original 12th century name Wellesley was reverted to by the family in 1798, was almost certainly born in Dublin and not Trim, County Meath and, almost certainly, on 1st May, 1769 and not 29th March as has been claimed. These discrepancies are characteristic of a man, lonely and withdrawn in his youth, reticent in nature and notoriously indifferent to the impact he was making on history. father of Wellington. Grand Master, 1776. Wellington was the third of the five sons born to Garret Wesley III and Anne Hill. Every single one of the Wesley children was to excel in his own field of endeavour and Arthur, amongst them, scintillated throughout his life-long career. His early education in Trim, later in London and from 1781 to 1784 at Eton College culminated, after an additional 2 years of private tuition, in his joining the prestigious Royal Academy of Equitation at Angers in Anjou, France. Although he was to return to England after just one year, the influence of the director of the Academy, Marcel de Pignerolle, was to make of Wellington a cosmopolitan Englishman and his military experience there was to serve him for life. There appears to be no doubt that Wellington would have preferred a University education and service to his country in civilian life. Through the influence of his elder Brother Richard, however, he was launched on a military career from the start. He returned to Ireland in February 1788 an officer and was appointed aide-de-camp to the Lord Lieutenant and simultaneously followed in the political footsteps of the family. A Wesley had had a presence in the Irish Parliament since its inception as an independent Assembly in 1782. In April 1790 Arthur was elected Member of Parliament for Trim, Ireland. He was 21 years old. His decision to be initiated into the family Lodge on 7th December of the same year may have been influenced by political expediency. There is no doubt, however, of the intense involvement of his immediate family in the Craft. Both his father and his brother served as Masters of the Trim Lodge No. 494 and they both reached the peak of their Masonic careers as Grand Masters of the Grand Lodge of Ireland. 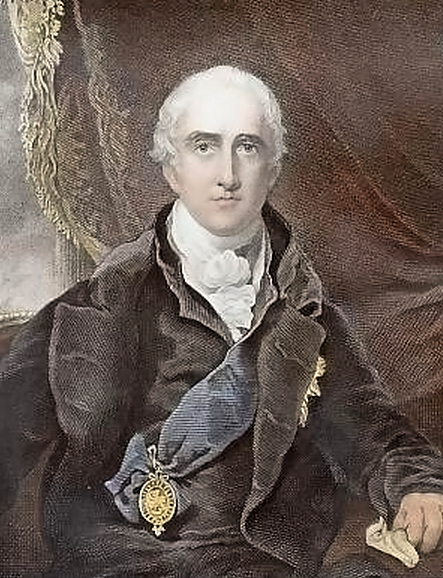 Garrett Wellesley, 1st Earl of Mornington, was proposed as a member of the Lodge by one of its founders, John Boulger, and raised a Master Mason in July 1775. A year later he served as Worshipful Master of the Lodge and was elected Grand Master of the Grand Lodge of Ireland, serving for one year, as was customary at the time, being succeeded by the Duke of Leinster in 1776. His eldest son, Richard, 3rd Baron and 2nd Earl of Mornington, was raised on 31st July 1781 having paid his late father's arrears and his own admission fee a few weeks earlier. A year later he followed in the footsteps of the Right Honourable William Randall, Earl of Antrim (who also served as Grand Master of the Antients Grand Lodge of England) as the new Grand Master of Ireland. Wellington would no doubt have followed in their footsteps had time permitted him to pursue his Masonic career. There is no reason to suppose that the young Arthur was in any way disenchanted with the craft. The Lodge records show that on 7th December 1790 he paid his admittance fee of £2 5s 6d. He is here referred to as the Honorable Capt. Wesley. of part of their fifty pounds are . . . the Honorable A. Wesley...."
"Perhaps it is not generally known that he (the Duke of Wellington) was a mason; he was made in Ireland; and often when in Spain, where Masonry was prohibited, in conversation (with Lord Combermere), he regretted repeatedly how sorry he was his military duties had prevented him taking the active part his feelings dictated....."
In June 1794 Wellington left Cork for Ostend in command of a brigade for active service for the first time in his career. He returned home nearly a year later, a respected and recognized soldier. He finally resigned from the Lodge when he was posted to Austria and then to India in 1796, in command of the 33rd Regiment. At the end of the eight-year spell in India, Arthur Wesley appears to have been undecided on his choice of career as soldier or politician. Clearly, in either case he wished for the highest position that may have been available to him. He returned to England in September 1805 crowned with glory and honours and in April 1806 was elected Member of Parliament for Rye in Sussex. (He was later to represent Mitchell, Cornwall and Newport, Isle of Wight). Exactly a year later he joined the Duke of Portland's Tory Government as Chief Secretary for Ireland. Meanwhile his military career was reaching a peak. In 1808 he was made a Lieutenant General and involved in the various military campaigns against Napoleon familiarly referred to as the Peninsular War, which ended with the Battle of Toulouse in April 1814. "an amusement which, however innocent in itself and allowed by the law of Great Britain, is a violation of the law of this (Portugal) Country, and very disagreeable to the people." The Portuguese presumed Wellington to be an active Freemason, not appreciating that he had not progressed beyond his initiation. They presumed that his inactivity as a Mason was merely a matter of discretion because of political sensitivities. Only five years later Wellington was again to come face to face with his Masonic reputation. Marshal Michel Ney, who famously met his end during the White Terror as a traitor, executed by a firing squad on the 7th December, 1815 in a Paris public park, recognized Wellington as a full-fledged Masonic brother. In a document now apparently lost between Apsley House and the Southampton University archives, Marshal Ney appealed to Wellington as a Brother to assist and save his life.Wellington was not in a position to intervene. Ney had been initiated in Le Trinosophes Lodge number 494 in Paris under the Grand Orient of France and a legend has persisted that the Bravest of the Brave, as he had been referred to by Napoleon, escaped execution with the help of French Freemasons and the Duke of Wellington. The legend is perpetrated by the inscription on Peter Stuart Ney's tomb in the Third Creek Presbyterian Church in rural Rowan County, North Carolina, USA: In memory of Peter Stuart Ney, a native of France and soldier of the French Revolution under Napoleon Bonaparte, who departed this life Dec. 15, 1846, aged 77 years. Peter Stuart Ney, a schoolmaster, was buried there in 1846. His last words on his deathbed are reported to have been: By all that is holy, I am Marshal Ney of France!. Wellington's military career was to reach its glorious peak on 18 June 1815 with the defeat of Napoleon in the Battle of Waterloo. He served as Commander in Chief of the Occupation forces until his return to England in November 1818 and within a month had been appointed to the Cabinet of Prime Minister the Earl of Liverpool, as Master-General of Ordnance. His continued, if somewhat tumultuous, political career was also crowned with success when he was made Prime Minister on 9th January, 1828. He was an active politician and kept his hand in military matters into his 80s. "... (the Duke) perfectly recollects he was admitted to the lowest grade of Free Masonry in a Lodge which was fixed at Trim, in the County of Meath. He has never since attended a Lodge of Free Masons. He cannot say that he knows anything of the Art. His consent to give this Lodge his Name would be a ridiculous assumption of the reputation of being attached to free Masonry; in addition to being a misrepresentation. The Duke of Wellington hopes, therefore, that Mr Carleton will excuse the Duke for declining to comply with his suggestion..."
Monuments at the Phoenix Park, Dublin and Trim, County Meath erected to honour the Duke of Wellington. The Memorial of Lodge No. 494 formerly held in Trim but now in Dublin respectfully sheweth that on the seventh day of December 1790 His Grace The Duke of Wellington then the Honorable Capt. Wesley was admitted a member of said Lodge No. 494. James McDonnell Master, William Wilson SW, Frank Thorpe Porter JW, Richard Pirn Secretary." "Read a Memorial from Lodge 494 requesting permission to take the title of the Wellington Lodge. The Board recommend that said request be granted. Postponed for the reconsideration of Lodge 494." "That this Lodge do communicate to the Grand Lodge their sense of the kind feeling they have received through the Secretary respecting the Memorial presented praying to be allowed in future to call themselves the Wellington Lodge and in consequence of the suggestions by him so expressed they beg to withdraw said memorial." 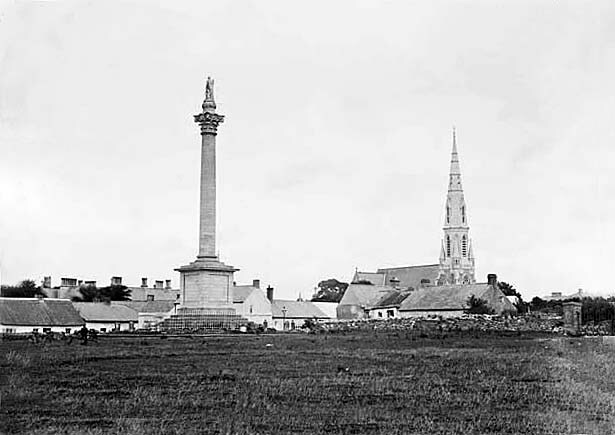 Wellington Monument, Trim, County Meath. "London October 13, 1851 F M The Duke of Wellington presents his compliments to Mr Walsh. He has received his letter of 7th ult. The Duke has no recollection of having been admitted a Freemason. He has no knowledge of that association." Chetwood Crawley has correctly pointed out that the Duke of Wellington was now in his 82nd year and that his blunt retort to an impertinent inquirer is much in character. The Duke of Wellington stands out as England's greatest military hero and outstanding politician. Circumstances did not allow him to pursue a Masonic career. It detracts little from the pride we take in the Wesleys' membership of our ancient Craft. W.Bro. Yasha Beresiner is one of the world's foremost and respected Masonic historians. W.Bro. Yasha Beresiner was initiated in London in 1975 and in 1991 he was invited to become a full member of the Quatuor Coronati Lodge No 2076, serving as Master of this Premier Lodge of Masonic Research in 1997/8. He was appointed to Past Grand Standard Bearer of the United Grand Lodge of England in April 2003. He enjoys higher Grand Rank status under the jurisdictions of the Grand Lodge of the State of Israel (Hon SGW) and the Regular Grand Lodge of Italy (PSGW). He also holds Grand Rank in the Royal Arch, is Deputy District Grand Master in the Mark and Royal Ark Mariner and is active in many other orders beyond the Craft. He is a Kellerman Lecturer and toured South Africa, Australia and New Zealand under the auspices of the ANZMRC in 2000. In February 2009, he was appointed the 2009 Blue Friar in Alexandria, Virginia USA. He has had an extensive Masonic career, has had 4 books and hundreds of articles on Freemasonry published and is writing regularly in Freemasonry Today, the official publication of the United Grand Lodge of England. Outside of Freemasonry Yasha is active in the City of London, a Past Master (2001-2) of the ancient City Livery Company: Makers of Playing Cards founded in 1628 and a Committee Member of the Bishopsgate Ward Club, he is a qualified City guide (2002/3) and is the current Editor of Cityguide magazine. His hobbies - in addition to 6 grand children - include all aspects of ‘the Square Mile'; writing and lecturing (author of 11 books and multitude of articles on collectables etc); Bridge (County Master level) and languages (fluent in English, French, Italian, Spanish, Hebrew and Turkish). To complement the above paper by Bro. Beresiner, you can access a paper by the renowned Irish Masonic Historian, Bro. W.J. Chetwode Crawley, on the Wesley Family connections with Irish Freemasonry through the following link "The Wesleys and Irish Freemasonry". The Paper was originally published in Ars Quatuor Coronatorum, Volume XV (1902), pages 100-124. The paper, apart from detailing the Masonic career of the Duke of Wellington and his family, goes to great lengths to disprove that the famous Rev. John Wesley (a distant relative) was a Freemason. The Wesleys apparently changed the spelling of their surname to "Wellesley" because of this distant relationship.